Artisan Restaurant is a new highlight in the Paso Robles culinary scene, and chef Chris Kobayashi provided this delicious recipe to pair with the Tablas Creek 2005 Counoise. In a saucier or Dutch oven over medium heat, combine the grits, water, milk, salt and 2 Tbsp. butter and bring to a boil. Reduce heat to low, cover and simmer, stirring occasionally, until tender, 45-60 minutes. If grits become too thick, add more water. Remove from heat and stir in remaining 2 Tbsp. butter, cheddar, smoked gouda and Parmigiano-Reggiano cheeses, pepper and tabasco. Reserve and keep warm. For the shrimp, cook the bacon in a large sauté pan until crisp. Set bacon aside and drain excess grease from pan. Add 1-2 Tbs. olive oil to the pan. Sauté the sliced mushrooms over medium heat until caramelized, about 10 minutes. Add half the onions and continue to sauté for 2-3 more minutes. Remove from heat and stir in grated garlic, lemon juice, halved red grape tomatoes and cooked bacon. Cover and set aside while you grill the shrimp. Build a charcoal fire or preheat a gas grill to medium. Toss shrimp with more oil and season with salt. Place shrimp on cooking grate over direct medium heat, cover and grill 2-3 minutes on each side or until shrimp are pink and slightly curled (smaller shrimp take less time). 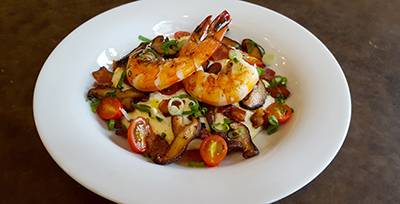 Remove shrimp from grill to a clean platter and add them to the bacon-mushroom mixture. Stir and reheat on medium low heat until very hot, about 5 minutes. Stir the grits if necessary. Divide grits equally among four plates, top with equal portions of grilled shrimp, and sprinkle with chopped fresh parsley and remaining green onions. Let rest for a few minutes and then serve.